Happy Sunday indeed! I have been so busy with my new volunteer adventure with the Pancreatic Cancer Action Network (more on that soon), working & running. Finally I have a moment to sit down and take some time to show the blog some love. Where to begin — how about with goals. I set a goal to run 1,000 miles this year. I am excited because I am on track to succeed even though I am little behind this month (to hit the goal, I must average 3 miles per day). 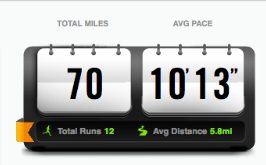 As of today, I have run 70 miles. WooHoo!!! February I will make up for what I did not do in January. I will start the month off strong with my 1st half marathon of the year. The 31st Annual Kaiser Permanente half marathon and 5K Fun Run is a certified 13.1 mile course and ranked as one of the most scenic in the country by Runner’s World. This race has been selected as Road Race of the Year by the Road Runners Club of America. I am very excited to run this. 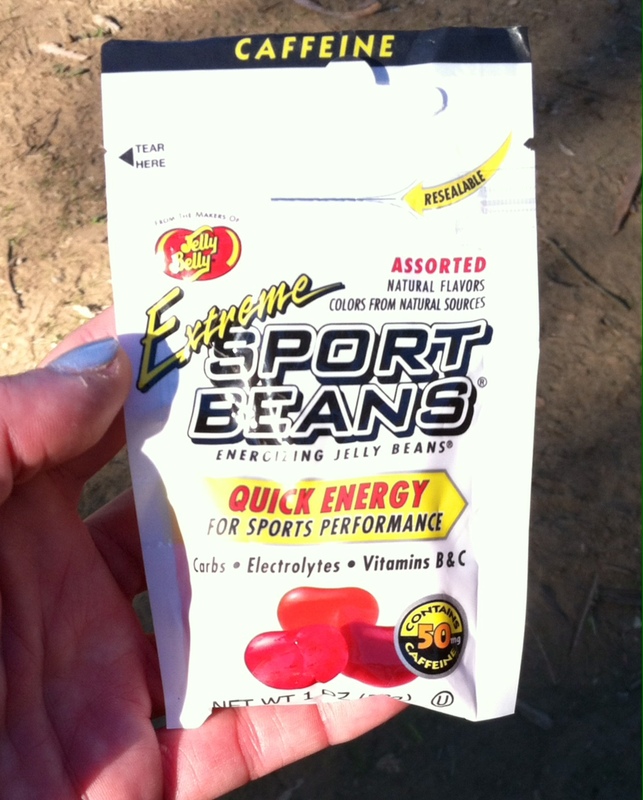 The Hot Chocolate 15k I did a couple weeks ago was a portion of the race, so I feel very prepared. Our friend Dena had created a 13 week training calendar for that race back in 2012 and I have been using it to set myself up for success in every half marathon I train for. I count backwards from the race date, 13 weeks and fill in the dates. If anyone is interested, I uploaded it to google drive to share. (click on the words google drive to access the link) I love to print it out & hang on the refrigerator. Every day, I see it and know what my miles for the day are. Each day gets crossed off as I count down to the big day. Don’t forget to leave me a comment below with your favorite wines. I am always looking to try new ones. Next #Winezday is February 19th. Look forward to sharing some delicious finds. Life’s too short to drink bad wine! It’s true. You know it. Life truly is too short to drink bad wine. A couple weeks ago, (4 to be exact, thank you Instagram time stamp) my friend Amber posted a picture on Instagram of a new wine on she tried and tagged me in it. The caption read: “yummy delight”. How could I not want to try this? Our Meritage is a classice blend of Cabernet Sauvignon, Merlot, Malbec, Petit Verdot and Cabernet Franc from some of California’s premier red-wine appellations. This richly textured wine has flavors of cherry, dark chocolate, black raspberry, and vanilla, culminating in a full, lingering finish. Enjoy with grilled or roasted meats and heavy vegetables. I have say I was pleasantly surprised. It was indeed “Yummy Delight!”. This is a tasty blended wine that you could bring to a party (while not breaking the bank) and even a white wine only lover could enjoy. Price point here on the West Coast is $8.99 – $12.99 depending on where you purchase. Who has a suggestion for next month’s #winezday? What a weekend, and it’s not over yet! Saturday was the #RnRSF Course Launch Party at Sports Basement, Presidio (610 Old Mason St.) I got there early so I could grab my Hot Chocolate 15k swag bag and bib for the race Sunday. I also finally got to meet Pavement Runner, aka Brian! Was nice to finally meet the man behind the twitter handle @pavementrunner and learn his real name. After we watched the video of the course (which looks like it will be fun & hilly!) 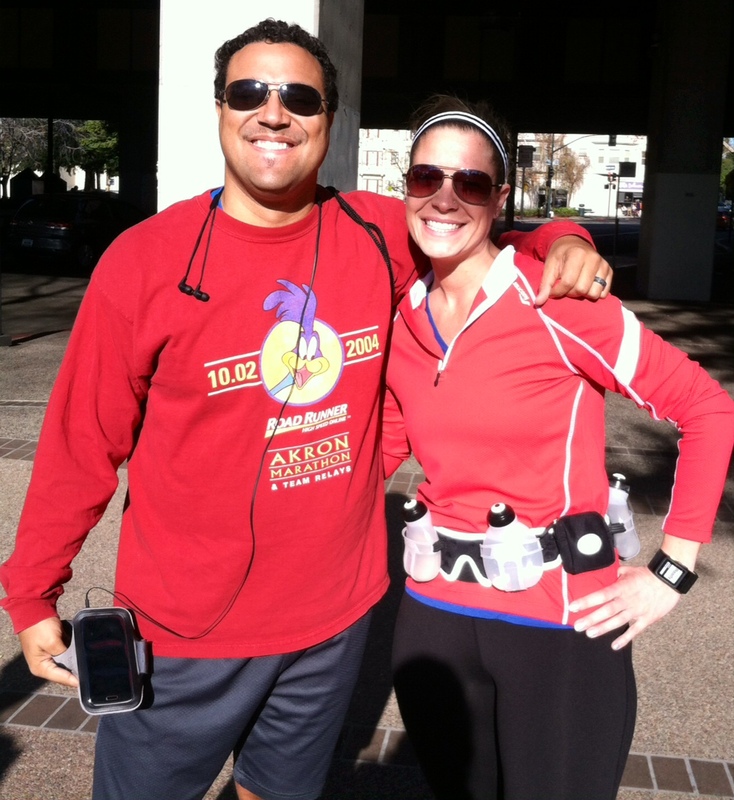 we went out for a fun 3.5 mile run with Mario Fraioli & Marathon Matt Pace Team. Headed home after that and down to San Jose. We caught most of the New England Patriots on tv and then made our way to the SAP Center to cheer on the Boston Bruins vs San Jose Sharks. Both Boston teams won! WooHoo! After a late night (didn’t get in until Midnight), 4:45am came very quickly today. 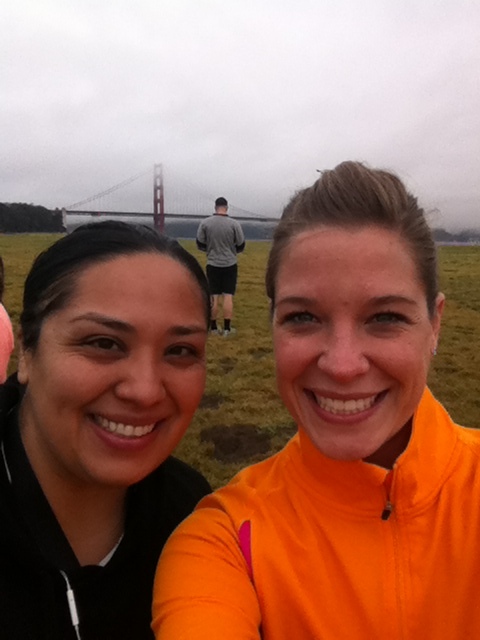 I crawled out of bed and made my way over to Golden Gate Park for the Hot Chocolate 5k/15k . With 10,000 participants I thought I would have a hard time finding my twitter friend Brie, who is a Boston transplant here in the city. We have been social media friends for a couple of months so it was great to finally meet her! After chatting for a bit we wished each other well and made way to the starting line. My personal goal for this 9 miler was to run the entire thing, no stopping. (primarily because I had to hurry and get back home for work, and I also wanted to catch the San Francisco 49ers game.) As the race started, I quickly realized that this goal was most likely not going to happen, I couldn’t feel my feet, they were so cold. It was very chilly this morning I had a hard time warming up. Finally after we exited Golden Gate Park (roughly mile 2.5) and made our way to the Great Highway, the sun was shining along the ocean front and I finally warmed. At mile marker 5 I was still going strong. 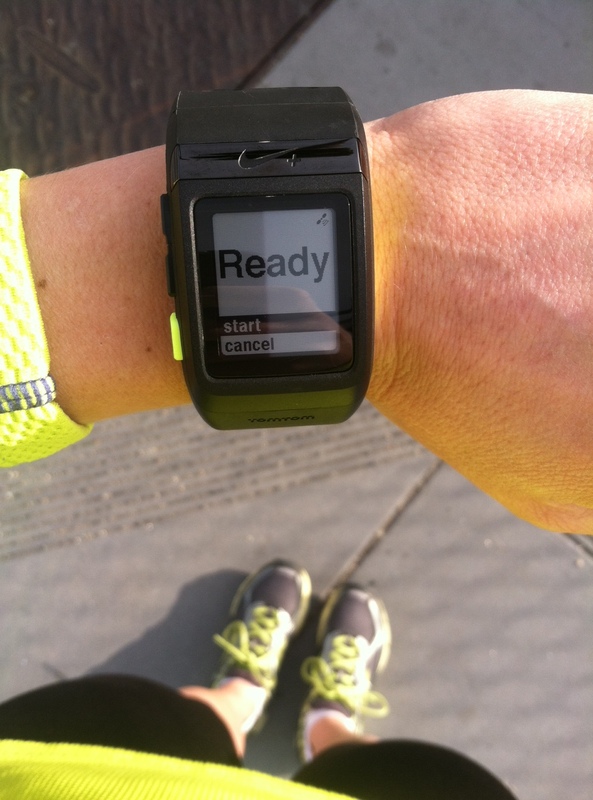 Checked out my Nike Plus watch and I was right on track, averaging a 9:30pace. I’ve got this! At mile 8 the volunteers were cheering us on and pushing us to step it up and finish strong. I looked at the girl behind me and playfully said “I’ll race you…” I ended running the last 1.4 miles at an 8:20 min pace. It’s amazing what a little motivation can do. 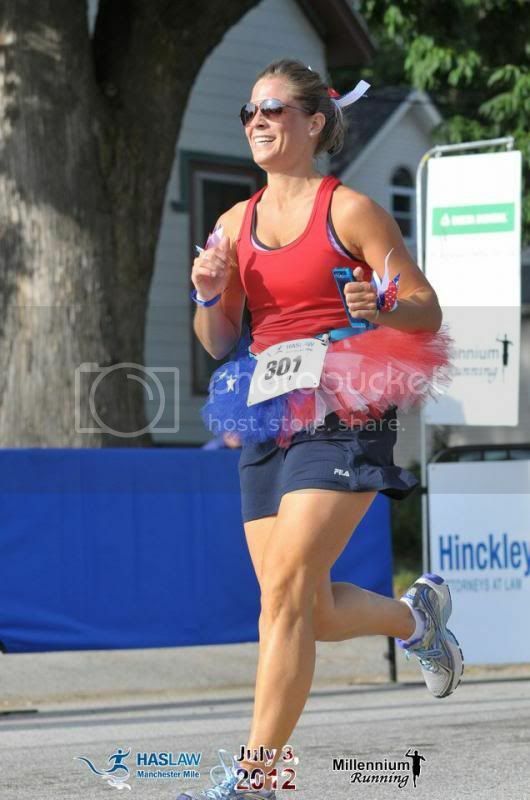 As I approached the finish line, the announcers called my name out and asked for a wave to go along with my smile. So cool. Thank you Brie for tweeting me into running this. It was a great race, It was great to meet you, It was a great morning. I will definitely do it again next year. Watched the sunrise, met a new friend, ran 9 miles with beautiful ocean views & was rewarded with chocolate fondue at the finish line. I am really looking forward to this weekend. It is going to be a busy one, but a great one. It starts Saturday morning with the official Course Launch Party for the 2014 Rock ‘n’ Roll Half Marathon that I am running in April (4/6/14 here in SF). If you haven’t signed up yet, click here for details. Very excited seeing Pavement Runner announce on his blog today that he will also be at the #RnRSF Course Launch Party. I “met” him via twitter, but have yet to meet in person, #TweetUpMeetUp ! After the launch party, I have to boogie home and get ready to head down to San Jose for an evening full of Boston Sports! We have the New England Patriots on at 5pm (PST) to catch on tv before we head to the SAP Center to catch the Boston Bruins vs San Jose Sharks. I can’t wait. Sunday morning 5am will come quick. I’m sleepy thinking about it. Sunday is my first official race this year. The Hot Chocolate 15k course looks great. 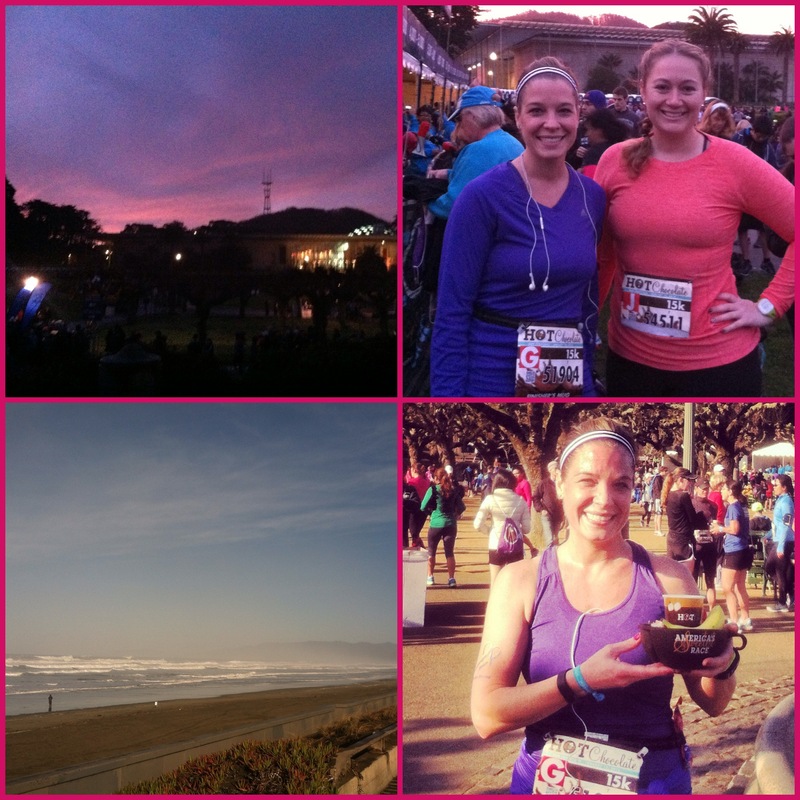 The run starts in Golden Gate Park and then down along the Great Highway (it’s along the beach for anyone who doesn’t know) I wasn’t going to run this race, but my new twitter gal pal Brie (http://runfunfood.com/) tweeted me into it. Look forward to meeting her on Sunday as well for my second #TweetUpMeetUp of the weekend. 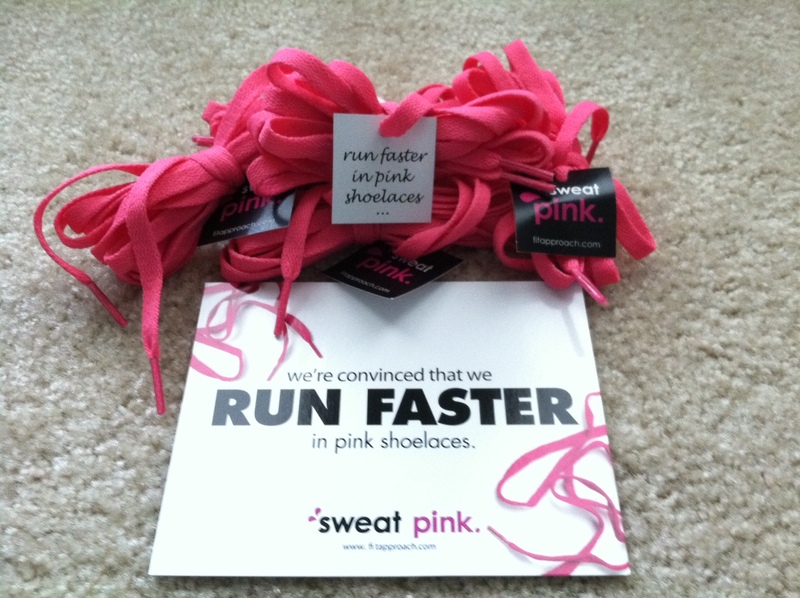 We will lace up our #sweatpink laces and enjoy the race! A portion of the course is the same as the Kaiser Permanente half marathon I am running in February, so this will be good practice. I’m posting a recap, so clearly I survived. At mile 1.5, I wasn’t sure I was going to. I know what you’re thinking — is she serious? 1.5 miles in, she was complaining??? Yes I am completely serious. Allow me to explain. Justin (my neighbor) is the one who told me about the Meetup.com group he found. They were doing this 8 mile trail run and it sounded fun. We met up in the morning and made the trek down to the muni bus stop. (Riding Muni & Bart was a first for me today. Can you believe I have been in the city for just about 10 months and this was my first time on public transportation?!? It was dirty and stinky just like I thought it would be!) We made our way over to the Rockridge Bart Station . We were excited to get going. Weather was perfect! Justin and I thought about turning around and heading back home by mile 2.5. We pushed ourselves a little further. We thought this run wasn’t for us. Just as we were about to surrender, we saw the rest of our group waiting for us around the bend. WHAT? They waited for us? They were cheering for us to finish. Okay, we got this. After a couple high fives were tossed and we caught our breath, I asked the group leader if there were more intense hills. I told him we just were not prepared. He was honest and said yes, 400 or so more intense feet and the rewarding panoramic view of the bay was just up ahead. He was right. We sucked it up and boy am I glad we did. What a view! 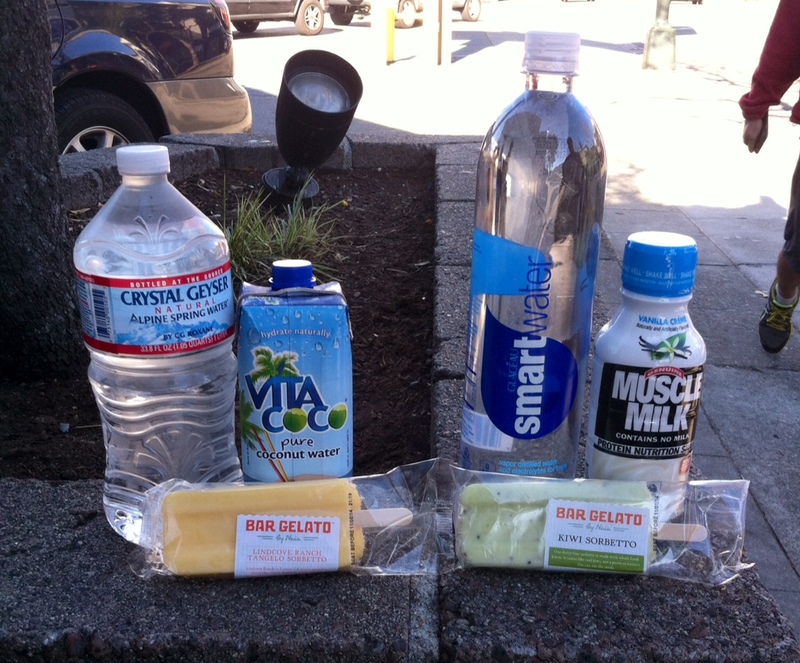 After what felt like hours, our run came to an end right back where we started – Rockridge Bart Station. All in all it was a good run even though we were severely unprepared. I look forward to conquering that massive hill in the future. 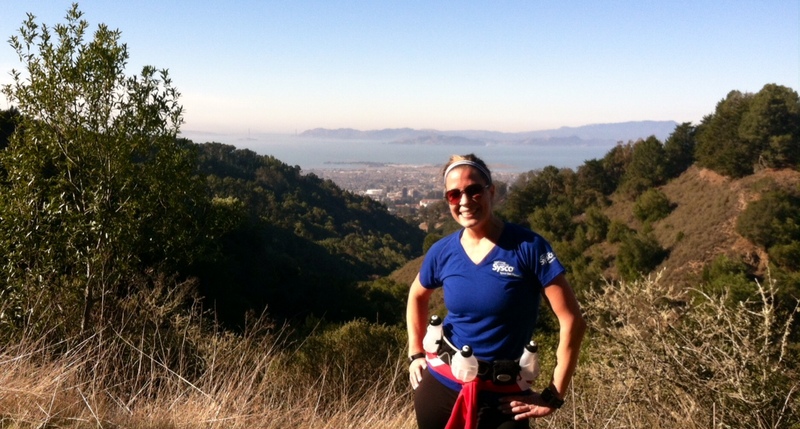 Here’s a link to the route: Happy Saturday! I’ll do a recap of our 8 mile trail run this weekend. Hopefully I will have some pictures that do the view no justice! Enjoy your weekend. I hope everyone had a fantastic New Years Eve & and a great New Years Day. I know I did. 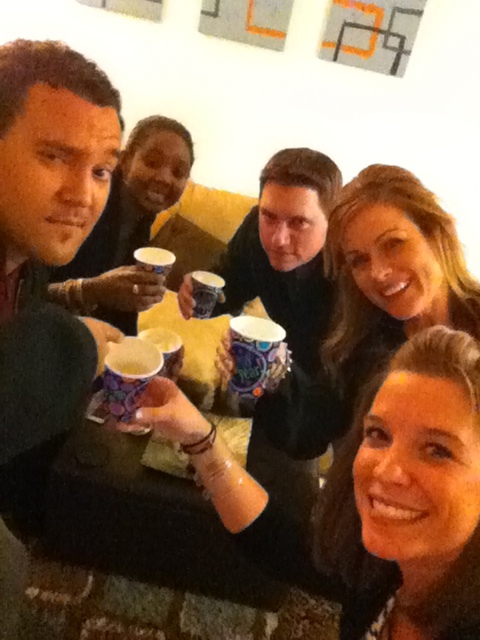 We rang in the new year with some of our new friends at our place. Drinks flowed, Cards Against Humanity was played, laughs were shared & memories were made. 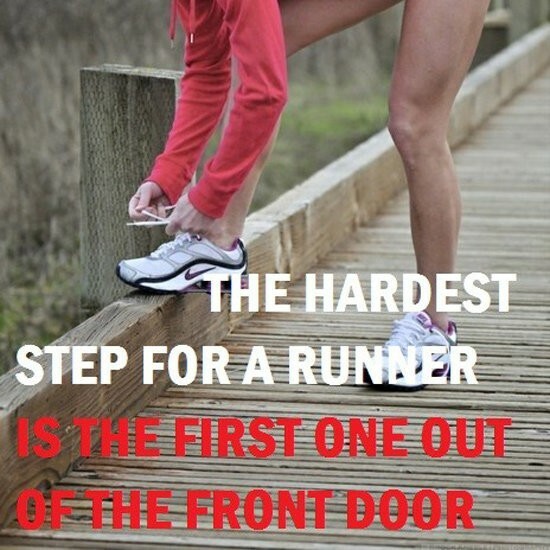 I have challenged myself to run 1,000 miles this year and also do monthly challenges. After some re-hydration (thanks NUUN!) I dusted off my shoes and headed out for my first run of the year. Beautiful day for 3 miles. I did my January Monthly Challenge when I got back – Plank A Day. Successful 20 seconds. For anyone who wants to join the Plank A Day Challenge, click here.